Um...Not All Coils Are Thick! I hated relaxer day! While many women looked forward to fixing their roots and having swinging’ hair, I hated my freshly done hair. Why you ask? Because it had no life. It was long, jet black and perfectly straight, but it was thin. If placed in a ponytail, it looked bald from afar, and dropping it and having it fall lifelessly around my face was never an option. Add to the mix my disastrous encounter with a certain product line which won’t be named that broke and thinned out my hair some more, let’s just say that what the doctor prescribed was not the miracle for my hair. I was so fed up that I decided to go natural and have the thick gorgeous hair of which I had always dreamed. I wanted disrespectfully big hair that blocked people in movie theaters and required people to walk around it on the sidewalk. I wanted to rock twists and big, yet defined, twist and braid outs. I wanted feel the wind blowing through my hair, not on my scalp. Fast forward two years and I’m still waiting for the thickness, but tomorrow I’ll look like Chaka. The truth is, not every natural has thick hair. More specifically, not every natural in the 4 category has thick hair. Because of my coils and waves when I wear my hair loose, it appears to be denser than it really is, but the moment I twist or braid my hair it becomes very apparent that I just wasn’t blessed with a lot of hair. If you are a fine haired natural, you can probably relate to a lot of my issues. I know it’s wrong to be jealous, but I have to admit that I’m envious of thick haired people and all their hair. I know, I know, thick hair people want finer hair too. The grass is greener on the other side I guess. Either way, I have good reasons for wanting your thick mane! Doing smaller plaits, as small plaits equal thicker looking hair while bigger plaits show off my scalp more. Parting the hair diagonally or in a brick like pattern. As a fine haired natural, hiding my scalp is something I have become accustomed to. When I see videos with women simply unraveling and separating twists for fierce twist outs, I have to fight my inner jealous self. After releasing my twists, I have to do just about everything to hide my scalp. I have tried fluffing both upright and with my head upside down, separating twists until no end, massaging my scalp and combing out my roots. And don’t get me started on the yoga/gymnastic twists I have to do in front of the mirror with another one in my hand assessing the back of my head for peek-a-boo scalp. But, after many a trial and tribulation, I have figured out that if I style on already stretched hair I can get more volume. I’m going to give it to you straight, no chaser: you are going to have to sacrifice definition for bigness, because we thin haired girls will have to separate and fluff more than the average curly. Now that I’ve ranted and raved and doled out a little advice, I feel so much better. But it would be good to know that I’m not the only one, so let me know about your experiences with thin hair. I've been blessed with thick, yet fine to medium 4a/b stranded hair, so volume is not a problem for me. My sister has fine 3c/4a hair, but it is incredibly thick as well--it runs in our family. I simply take my twist down in the morning, shake, run my fingers through, and go. The only place you can see my scalp is on my part. I think that parting diagonally is good for thick or thin hair b/c it helps the twist out lay better. Loved the post, especially since I don't have the thickest locks of hair myself. One tip that I would add is the less product, the more thicker my hair will look. Heavy butters and cremes will only way the hair down, so I would use these things sparingly. I don't know if this is weird to say, but the dryer my hair is, the more volume I have, now of course I can't let it get to dry but I hope you get what I mean. I do find that blow-drying my hair with a twistout is the best route to reduce shrinkage and scalpiness, however on most occasions, a little scalp showing doesn't bother me that much. I do wish that I could also get full twists to rock that protective style but that's okay because my hair is more easily manageable than more thick coilers. I can relate to the thin hair syndrome. At the beginning of my hair journey it was pretty frustrating trying to style my TWA. Now several months in I have grown to love my hair the way it is and concentrate more on keeping it healthy and preventing breakage. I do admit though that the scalpy hairstyles are still annoying but I still walk out the door rocking it!! I FEEL YOUR PAIN!!!!! I can't stand that I don't have that full head of hair, but at least I can say my wash days aren't as hectic! LOL! I agree with "Starving Theatre Artist"...I use lighter products on my hair to give the appearance of thicker hair. I still love my Burnt Sugar Pomade, but I can only use a little bit on my ends. I still do twists as a PS, but I just keep them pinned up. I am one of those fine haired Naturals. I too am waiting for the thickness! I want the big hair just like you so you are not alone. When you say "fine" do you mean not dense? I ask because my hair is dense (meaning that you can't even dream of seeing my scalp) but my strands themselves are "fine" meaning that the strands are small. I have always been confused by this. Great post! I get jealous sometimes when I see women with thick curls. I had thicker hair as a younger woman, but relaxers and a certain person who told me that my hair needed to be thinned out in order for the weave to look better (1986), have caused me to have thinner tresses. I tell myself that it doesn't bother me because at least my hair is healthy and that's all that matters, but I am envious sometimes. I cannot do twists or braids because by the time I try to get all the parts out of my head, any definition or curls are completely shot. I continue to do my wash & go's. I'm still very happy with my hair overall. Thank you! LACK OF THICK COILS was one of the things that frustrated my newly natural journey. I had no idea that my hair's fine density was the reason why the final style never looked right! I though it was product selection, and I became the worst product junkie because of it. This should be a "sticky"!! I have a tapered TWA. To get a decent style, I create chunky coils at the nape, hair pinned bantu knots at the ear level and twist outs at the crown and upper sides. 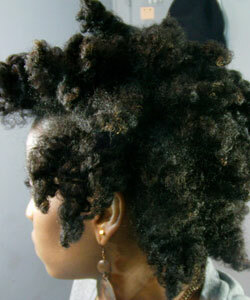 When dry, I untwist and let it rest a few minuts before I break up the twists, knots and nape coils. I finger fluff and use a pick to lift for volume. No heat for me. My 4c is too dry. When thoroughly dry, this process gives me great overnight definition, but I have to fluff it all out because I'M A FINE HAIRED NATURAL! lol! Every word of this is TRUTH! I know I need to do more protective styling but when your twists no matter how you part look spacy and scalpy it's hard to walk out of the house feeling good. I still do it but I'm so disaapointed in the look. I also have to separate, separate, separate to cover my scalp. All that lovely initial definition gone. That's just the hand I've been dealt. I will definitely embrace my thick head of hair. It just takes SO LONG to get through it. I have thin 4-type hair also, and I hate it when it comes to styling. I must admit though that I'm having better styling days as my hair gets longer. When I get too frustrated with trying to cover my scalp, I just take a break and go back to my wng's. Also, my hair's "thinness" shows more in the front where it's shorter so when my twist-outs don't come out quite right, I throw on a thick headband and walk out the door. What I'm really looking forward to is when it's long enough to bun. Omg let the church say Amen! I'm with you! Although, I don't like to say my hair is thin, I just say "fine" because it is fine. I have resorted to my trusty old puff because even when I try a twist-out or something of the sort, it still looks scarce! I can't complain though. It is more than I used to have with my relaxer days! I have seen women you are talking about, & its just genetics no matter what they do, natural, relax, Jheri Curl they have thin hair & so do most women in their family. I have been blessed with super thick hair and I hated getting a relaxer 'cause it made my hair appear thin. Now, Im 7 months post relaxer and I just love how thick and wavy my new growth is, and if one more person touch my hair Im gonna scream! You are SPEAKING my life!!! I've hated my fine hair.. I've roller set my fine hair just hoping for volume and it just doesn't happen.. I loved wen I needed a perm because my hair had a little bit of "oomph" only to have it flattened again.. I've gone natural since, but after doing my first twist out this weekend, I realize I might have to deal with healthier hair, but not thicker.. I spent too much time asking mom, "can you see my scalp? is it disguised?" Considering I have grey hair at my temples, from afar I look like I have no edges.. I'll love my hair no matter what.. After everything I put it through, I'm just happy still have some.. Yes!! So many people are confused about the fact that tightly curled=thick is not always true. I appreciate that when my hair is curly it appears "thick", well to others, but I know what's really going on. I still remember when I pressed my hair for the first time after years of being fully natural and how disappointed I was at how it just stuck to my head. All of the other women in the shop were in awe but I was disgusted. I wore it up the whole time is was straight. Needless to say, I decided to never let a pressing comb near my hair again. Now I'm experimenting with henna, and it seems to help but will see what happens with prolonged use. Keep your head up!! P.S. I have grey hair in the front too, and I'm 27!!! Henna all the way! That's something I'm not ready to embrace yet! I too have thin fine hair 4c and when I had perms it was extra thin and scalpy so when I went natural I knew it was the answer to all my prayers but then the moment came when I realized that "It will never be" full,luscious, and really BIG. I still refuse to look back because I know natural is the way to go...#Lovemynatural!! p.s. with my scalp issues, i've lost hair since becoming natural, and so mini twists, i just can't do anymoer, too scalpy :( i miss doing them too! i have fine strands and lower than average density, so i would overall describe my hair as thin. and i went throught the same jealous fits when i realized that i wouldn't have the MANES that i see on other naturals. it is bitter sweet, to say the least. but i deal. i hate what my twist outs look like when i put in smaller twists, but i hate that when i do larger twists, i literally have about 6 plaits on my whole head. it makes it hard to protective style b/c who wants to go to work, looking like they are in 3rd grade? sadly, there is just no way around that. i have already accepted that if i want big hair, i will have little to no definition. i have also accepted the fact that if i want my hair to grow, i have to keep it in protective styles more often than not. i try to plan my outings around my hair by deciding how to do it to achieve desired looks, but on the day to day, i typically do not apprciate my protectively styled hair. but i'm dealing. Wow i thoght having super thick hair was a curse. I always wanted the silkly curly hair you all are speaking of. I think there is a difference. Thin and fine are two different things. I have thick hair but my strands are fine. I have to go with stretched and very low manipulation and heat is my worst enemy. U my dear, described my hair to a "T." I have to wear a twist out for several days for the parts not to show, but by then there is no definition. yep this is me. i watch the youtube video of girls taking out their twist and just having this full head of hair and i'm like that doesn't happen for me. I have to wait until like day 4 hair befor they look all stretch, then it's time to redo them. @ Beauti you describe my hair to a tee. I have fine strands but many strands per square inch (high density fine hair) so on a day like today when I take my twists down after washing last night, I pin the unravelled sections strategically over my scalps to achieve a very defined updo. Tonight for bed, I will dampen my palms and apply to each section with a little product and retwist so that I have more volume to wear it out tomorrow and I follow this process throughout the week for fuller hair each day until the next wash day. another Low-density checking in. Twistout updos, yes. Simply rocking twists or a twist out, no way. It really is difficult not to be envious. My sister looks at me and refuses to go natural b/c her hair is too thick. However, I look at hair and think of all the styles I could do if I just had her hair type and density. I must admit though, when it comes time for detangling in the shower, I am pretty thankful for the lack of density. No long detangling sessions here. Fine hair naturals unite! I've accepted my hair and go for big as opposed to defined. Also I use homemade products that aren't heavy but still have hold. News to my ears...never knew people had issues with scalpyness. I too will now appreciate my thickness and remember that not everything on the other side is "greener"
This is EXACTLY what I have to do with my hair to achieve volume! I've gotten over that I'll never have well defined hair, I gotta cover this scalp LOL. It cracks me up when folks look at my fluffed out hair and try to tell me how thick it is. Boo bye with that LOL! All I can say right now is WOWZERS b/c I am a Thick-Haired 3c/4a Transitioner and all I have ever wanted was fine hair. Before growing my natural hair out it took me almost 4hours to wash, treat, dry and flat iron. Now, it has been almost 8 months since my last relaxer and I can't imagine getting a perm. As young African American women it amazes me how we are taught to want straight hair because it is known to be "better". I always felt having thinner hair was more manageable but with each passing day I have grown to love my thick curls and found ways to help manage it. Right now I wear my hair straight and only apply heat 1-2 times a month, if that. There is nothing like waking up in the morning, removing my scarf and using a bristle brush to unravel my almost fully natural hair. The wrap falls so effortless. Bantu knot outs are my best friends. They make my hair look thicker. One good thing about being of the fine, thin variety...it only takes 20 minutes to do twists for my twistouts. I've always had fine hair. As a relaxed head and of course as a natural 4 mos post BC. I learned how to make the best of relaxed fine hair (rollersets every night, no oiil past the deep conditioning stage, biotin). As a new natural, I thought that I could never wear twist outs because my scalp would show all over. So I wore fros for 3 months post BC. Then by accident, I found a solution and I now wear twists outs whenever my heart desires. One night, I twisted my hair. The circumference is always small because my hair is fine. the next morning, the twists were well defined into tiny spirals all over my head--but then the dreaded scalp peeked out. Out of fustraation, I wet my hair in the shower intending to get rid of the twist out and rock a fro, but the coils stayed,even after applying condish, but the water somehow expanded my roots. I used a lightweight gel to lock the style in place and no scalp was visible but my hair has delicious springy coils. As my hair gtown, the length of one layer covers any scalpy issues I used to have. I love being natural! I (like some of the other posters one here) have dense hair, meaning scalpiness isn't a problem, but when I put my hair into any kind of twists or braids makes it look like I have about 1 square inch of hair. My hair is a very tight 3c pattern with a bit of 4a thrown in. When my hair is down it can start the day glued to my head and by the end of the day it will be as large as possible, never mind what I have in it. I like that, but I have trouble figuring out "professional" styles. OMG! This is my story!!! My hair is full but fine! I cannot do twist outs, braid outs, single 2 strand twists, or single braids. This is my hair: it grows in layers, I have multiple curl pattern with the crown being the most coarse and fragile and the shortest, so my hair basically grows in layer...Because my hair is fine, when wearing it straighten its gets limp quickly so i never wear it straight for more than 5 days before washing. I resorted to twist sets ( with lots of fluffing) to get the look of a twist out. Also, when i straighten, I dont blow dry bone straight and I dont flat iron bone straight. for volume i curl and place on rollers until im ready to leave the house. No one really notices because overall, my hair density is pretty normal looking-not too thin and definitely not thick. I have noticed though, at times my hair is fuller when i havent neglected it for weeks in a bun and let the middle ball up on itself. Right now, I'm having a set back so it will be under wigs and protective styles until the fall. I feel some type of way too when i see luscious thick hair!!! I dream for mine to look that way, but until then, I will add textured hair pieces in my problem area to get the illusion...and before any of you get out of pocket because i use heat, I am a licensed stylist who specializes in natural hair so I know how to use heat without damage. My hair shrinkage and my client locks are proof! It can be done, just need to know how...But yes, i totally agree-i just dont have thick hair! and i've made peace with it now! I am soooooooooooooooooo scalpy I barely can stand it!!!! I'm still in the twa stage and when I do my finger coils, the first day I'm not so happy because of my scalp showing and that is even after pulling them apart. This was a much need post for me to read because I truly have been sad and extremely envious of my thick hair curly sisters. Thank you for this post, now I know im not the only one out there that doesn't have big hair. My husband, who convinced me to go natural, always asks me to pick out my hair. I finally tried it 2 weeks ago, boy was i let down. i never knew how thin my hair was. My hair was just limp, didn't make this nice big afro, i thought i would have. I agree with the little twist bit. i have to do about 5 twist per 2 inches of hair to get a good look. Can you recommend any other techniques for thin hair? I just wanted to say that you are not alone...I too realized very early on that twists and single braids were not for me because as you said, all you saw was scalp. Another thick-but-fine mostly-4b checking in and on the positive side: It doesn't take me nearly as long to do my hair as it does some of these thick-haired sisters. Spending hours literally IN your hair (as opposed to just sitting around with conditioner in it) isn't something I could ever see myself doing. Also, this probably goes without saying, but once your hair gets to a certain length the twists get better at hiding scalpiness. Parting in a brick or diamond pattern helps. When I saw LethalPleazure's YouTube video - my jaw dropped. I modified this for my go-to style. I have a tapered fro. I have fine hair as well. More of medium density. I find that misting my root with a water based liquid plumps them up and hides the parts/scalp. But, you have to be okay with puffy roots. I am good with them. My hair is 4b/c if you are into typing. I feel your pain! I have fine hair that is thin in the crown and gets a little thicker in the back. I'm always massaging my roots to hide my scalp whether I wear twist outs or a wng. I have just discovered that if I flat twist my hair from the back to the front that I have more volume and less scalp showing when I unravel the twists. 2.) Bantu knot each twist. Stretching gives you more length and the knots create bigger curls for more volume. Re-twisting and knotting each night creates bigger hair each day until wash day. I love it!! I too am apart of the thin haired community!! I am glad I am not alone in this journey!! I have tried so many things that just did not work!!! Thank you for posting this... I will definitely try these things out. Yal it finally sunk in when people started to say your hair looks thick but it's actually feels thin or fine. Then, I realized how easy it was to detangle. And how my hair as long as it was moisturized could be brushed right down and stay down without puffing back up. Wow! I've come a long way since then. And I've learned to except my fine hair. I'm also finding style that actually work better for my hair. Still I heart those thick heads of hair though! :) We're NEVER satisfied I tell yah! OMG this is so me!!! I have come to the realization that I just don't have the locks I see on all these blogs, but I'll manage. I've found a staple style that my hair loves and I'm sticking to it. I do a flat twist out on blow dried hair using flaxseed gel for definition. My hair turns out great all the time. Can't even tell how thin my hair is. OMGosh, we are so here>>><<<<!!! Story of my life!!! Frizz is a natural part of my twist out because I have to separate the twists so much. Everything you wrote is exactly me, lol!! I use frizz and shrinkage to my advantage by picking or misting just the roots of my twistouts. A good hair cut really matters too. The right layers add shape and reduce weight. I'm also a big fan of pins, clips, and headbands - they allow you to move hair around and shift weight where you want it. Also they are a visual distraction/enhancement. Also color is good for faking depth. We all gotta work with we got, so I channel my inner Tim Gunn and make it work. I don't wear twists, or ponytails, and my hair will never be longer than my shoulders. When I really must have big voluminous hair, I buy it. That simple. lady the same age as me who seemed to suffer from some sort of hair loss. work on being thankful for the hair that I do have. I definitely still have my moments, but I have cut back on my complaining drastically. Nearly a year and a half ago I began learning about and practicing better hair care techniques (proper detangling and moisturizing). This also included switching to SM Thickening shampoo. My hair has definitely gotten thicker within this time frame but in not sure if I can just attribute this to the shampoo or my new practices in general. Maybe it's both. But anyway, thanks LBell and Anon 2:01 for helping us to remember to look at the brighter side of things :) It is definitely a blessing to have any hair at all. Oh and it helps to come to a place of acceptance. I find that it's really no use drooling over vloggers with thick manes because that will never be me. I also know that with time and effort my hair is quite fly...fine and all!! Let's own what we have ladies and like previously mentioned, work with what we got!! You are not alone you have just described me and my hair to the "T". My hair is fine AND thin. Imagine my styling dilemma. I thought that going natural would give me thicker hair. I was wrong. One of the problems is that my ends are way thinner than my roots. I’m trying to hold onto my ends for dear life because I’m length obsessed. Because my hair is so fragile & protective styles don’t look right on me, I’ve been wearing wigs for 6 ½ months. It gives me lots of versatility and because my strands are so fragile, it gives my hair a chance to rest. This is an amazing post! I too have thin hair and I have grown to accept that wash and go's are my friend - I am trying to figure out the best protective styles for me that dont have me looking crazy so I am thankful for the tips here that I now have to go and employ. But I am so happy to read that I am not alone in this journey! THANK GOD I found this post! I really thought there was something wrong with me and my hair, now I know. It is what it is, and that's ok.
Reading your post, i could not help smilling, knowing am not alone as a fine haired natural :). I have a twa, and when i do a twistout, i have a battle with two mirrows, one at the front and one at the back to make sure no scalp is showing :). It's always tricky, and the twistout look fuller after a day or two. Am learnning more about my hair and embracing it as it grows. I have embraced my 4b hair (fractals) with up to 75% shrinkage. It looks thick but the hairs are thin. At one year BC I let go of the dream of the twist outs with little to no shrinkage I see on my YouTube sisters. I embraced and at 15 months BC, am striving to perfect my curly 'fro. That works for me. It hides those scalp issues. I prefer to keep it light with a little gel or gel cream rather than butters. The wind got a hold of it last week and inside I was grinning from ear to ear. A milestone reached. Next is growing it out so it bounces when I walk. Thanks for the post! And, ladies thanks for your input! I SWEAR I thought I was the ONLY natural with thin hair! For years I have taken pride in the fact that I am not a jealous female, but as others have said.. I DO have hair envy! I wish my hair was thicker, but it's not - so I have to live with it and find other ways to deal with my lack of hair! Even buying some! U guys are so positive! I have enjoyed reading your posts! This post is so on point!!! Thanks for sharing, just feels better that I'm not alone in trying to hide my scalp...sigh. I can totally identify with the 'scalpiness' especially when I put my hair in twists. Not sure what my hair type is (probably patches of 4a,4b & 3c), but it's definitely thin. Yes the smaller plaits/twists make a difference. Have never tried the other 2 techniques. Anyway, I'm learning to take my hair and all of me as is, and it sure feels good! lol. i have naturally thin hair. but lots of it. so i dont have to worry about my scalp showing but when i put my hair in a pony tail, its as thin as a pencil. if i braid it all in a single braid,, its smaller than one of my friend's double braids. and believe me, i get jealous. i have found that if you shower at night and put your hair in 5-7 braids (i say do it at night cuz it will look rediculous) while its still wet, sleep on it, wake up, take out the braids, and brush it. let it sit so it will calm down cuz it will be poofy. I totally agree with miss "natural thin hair but lots of it". That is my exact problem. I naturally have thin hair but my scalp is never the problem as much as it is my twist are skinny as a rail and I dont get very many twist and I definitely can't wear it out in public like that. I have thin hair also and have found myself envious of our thick haired sisters. When I was younger my hair was much thicker but relaxers really thinned mine. I am 4 months post relaxer and can see a difference in the fullness. Before my journey my scalp would show in areas after a roller set but now it doesn't. I'm hoping that this natural hair journey will bring me to the thicker hair I once had. Thank you for sharing. I have battled with my thin 4b hair all of my life! I still haven't figured this natural thing out. But, this blog has provided me with valuable info. This post is truly a godsend. It feels good to know that I am not the only one (I mean I've known that for sometime) but all these shared experiences are a relief. When I wear my hair "out" it looks so full but when in a protective style, scalp is definitely on display. My solution has been to wear a puff, or a version of a puff. One of my new favorite styles is the bun w/ Marley hair but I am still looking for styles that look good on me and that are achievable with my thin strands. I am also finding that I care less and less about how much scalp is showing. I still wear my my 2 strand twists and last week I wore 2 braids. One primary reason that I stay natural is because I am embracing MY nappy, kinked up, coiled down, THIN hair. Thank you for revelation. I feel empowered. =) lol. I am very happy I found THIS post. I am a youtube Curly Nikki die hard fan and NOBODY seemed to have thinner hair. My scalp doesn't necessarily show but my twists never look big and beautiful. I have to do multiple small ones to make it look like something. I HATE that. I am trying my best to be happy with it. I have been natural for 3 years and I never noticed this issue when I got a perm. But now since I do my own hair I'm a lot more focused on this issue.